Today we are going to take a look at the different ways that traders analyse the markets and more specifically, something which is known as Dow Theory. This unit will provide a basic Dow theory introduction. Most consider the father of technical analysis to be Charles Dow, one of the founders of Dow Jones and it’s the company which of course publishes The Wall Street Journal. The history of Dow Theory goes back to around 1900 when Charles was analysing the movements of the Dow Jones Industrial Average and the Dow Jones transportation index. During this time he noticed that these two indexes tend to move in predictable ways over time, or move in similar ways over time. So he outlined his findings in a series of papers. These papers were expanded upon over the years, by other traders and these papers became known as Dow Theory. Although Dow theory was written over a hundred years ago, most of the basic principles are still relevant today. Traders believe that these basic principles are also relevant to any market, not just the DJIA or the transportation index. Dow defines the first type of trend (pictured left) as an uptrend and you can see an example of an uptrend here. In it’s simplest form, an uptrend is current when the prices are making higher highs and higher lows. 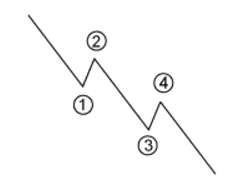 The second type of trend (pictured right) is a downtrend and that’s basically defined as when a market makes successive lower lows and lower highs. 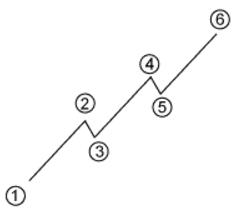 Next up is the third type of trend and this is a correction. When defining a correction, Dow describes the price of a market making a move sharply in one direction. Prices then briefly recede in the opposite direction, before continuing to move again in the same direction. So as an example, you can see the market in an uptrend, then a correction and then continuation of the original uptrend. The three phases are; accumulate, public participation and distribute. 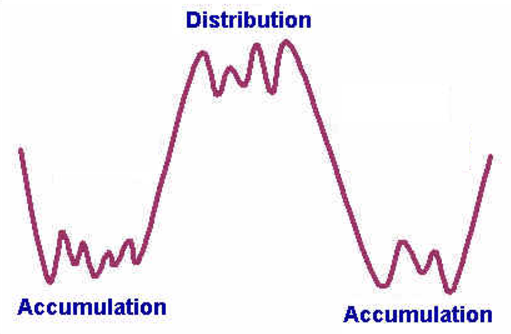 Accumulation is a period when ‘smart-money’ or expert traders begin to accumulate a position, by buying when prices are low. This can normally be seen as a going against the normal trend of the market. This continues until the general public catches on to what is happening and begins to join in. That is when public participation takes over and the ‘less-expert’ trader follows in the same direction. A lot of times you see a pretty rapid price increase during this time and price begins to accelerate. Normally at this point the ‘smart-money’ see all these buyers coming towards them and they begin to open their stalls and sell their positions. There is plenty of demand so prices will be good. They can distribute their position. Distribution is the last phase. This is when the public participation gets to excessive levels and rampant speculation catches on. At this stage the ‘smart money’ start exiting their trades before the eventual reversal of the trend. People who were scared of missing out, are basically buying, just in the hopes of selling to someone else at a higher price. Sometimes, that’s too late. Assuming that markets are fair, tenet three states that at the moment of a news release, the price reflects the news very quickly. So because of this, it’s difficult to beat the market by looking only at fundamental analysis. Dow says that you can do this with technical analysis. So far we know that the market having three trends, three phases and markets discount all news. Let’s continue to look at the second three tenets of Dow Theory. After this article, you will have a strong foundation to build on with more interesting technical analysis. Charles Dow formed Dow theory was working on the Dow Jones Industrial Average. He was also working with the Dow Jones transportation index. Now to understand this next part is important. During Dow’s time, around 1900, the US economy was a manufacturing based economy, today it’s a service based economy. So keep that in mind, because tenet 4 is not as relevant today as it was during Dow’s time. However, it is still worth looking at. What Dow was saying here is that a rise or fall in the Dow Jones Industrial Average would accompany a rise or fall in the Dow Jones transportation average and vice-versa. He’s saying that you have companies manufacturing the goods and companies shipping the goods. If the manufacturers are making lots of product and being profitable, then the shippers should be shipping lots of product and be profitable. So what he’s saying here is if there’s a divergence in these two indexes then it’s a signal of a pending change. If there is no divergence, then it’s a further confirmation of the trend. For the Dax, we can perhaps draw parallels to this theory. We are interested in the EuroStox50 or the FTSE100 or other, European-based, service-oriented, indices rather than industrial indices. This one is still very relevant today and something that technical traders place a heavy importance on. They are normally looking at volume in conjunction with their trend analysis. Dow is saying that there’s a lot of reasons why the price can move on low volume. For example, one trader could come into the market and move the price around, it’s impossible to tell. However, if large volume accompanies the price increase or decrease, it suggests many participants in the move. This additional participation, confirms that the trend is present. Here, you can see a range on the German Dax. The rising volume may create the eventual breakout and resulting trend. As the trend gets going, the volume begins to drop off. Only a few days before this article was written, there was a huge volume spike. Let’s see if it is significant, perhaps a signal that the trend is about to end. This is possibly the most subjective area of Dow Theory. Students of technical analysis constantly debate which of those signals prove that the trend is ending. The only way to be sure is to have good knowledge of all the various technical tools available. So over the following articles, we’re going to look at various technical studies and get a better understanding of how they relate to indices.